Apple has seeded the third beta version of OS X Mavericks 10.9.5 to Mac developers and non-developers (general public) for experimenting and testing purpose. The latest pre-release version i.e. OS X 10.9.5 Beta 3 (Build: 13F14) Mavericks Update is available instantly. 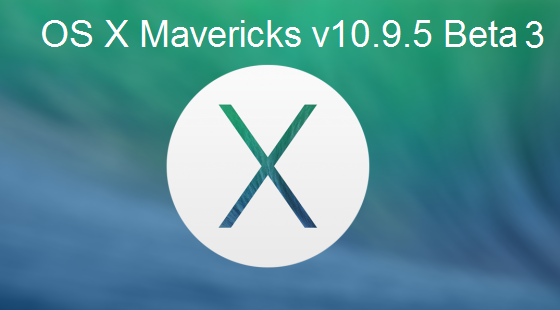 Mac users can officially Download OS X Mavericks 10.9.5 Beta 3 (13F14) Combo / Delta Update .DMG File via Direct Links for Free. Mac OS X Mavericks 10.9.5 Beta 3 (Build: 13F14) Update official changelog contains; Fixes for Safari Web Browser, USB, Graphics, USB Smart Cards, and Thunderbolt integration issues. The update also holds fixation of bugs and errors, fixation of system software performance enhancements, stability, improvements issues and problems with the inclusion of new features and functionalities. Apple has also seeded and released Safari 7.0.6 for OS X Mavericks and Safari 6.1.6 for OS X Mountain Lion, which contains improvements and fixes for security related updates on Apple’s desktop web browser. Safari v6.1.6 and Safari v7.0.6 are available for OS X Mavericks 10.9.4, OS X Mountain Lion 10.8.5, OS X Lion Server 10.7.5 and OS X Lion 10.7.5. Click here to read Safari update changelog. How to Manually Download and Install OS X 10.9.5 Beta 3 (13F14) Update? Mac OS X developers and general users can update / upgrade old software version automatically via Mac App Store >> Software Update option. Mac OS X registered developers can officially download OS X 10.9.5 Beta 3 (13F14) via OS X Dev Center website. Mac OS X non-registered non-developers (general users) and OS X Public Beta Seed Program subscribers can go to Apple OS X Beta Seed Program website to download OS X 10.9.5 Beta 3 (13F14) for Free, and can manually install the update via iTunes without Apple UDID registration and without having Mac OS X Developer Account.